make it perfect: .Summer Carnival. 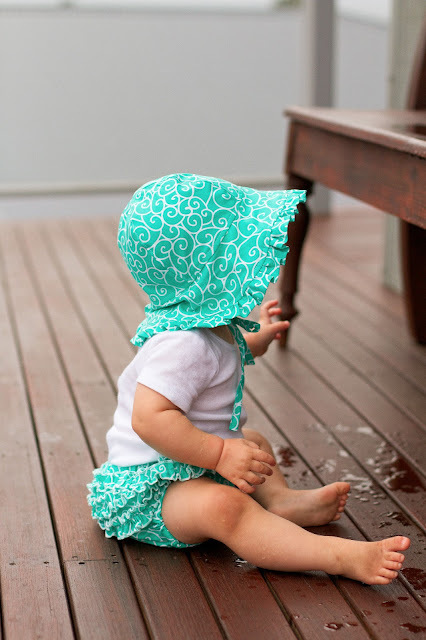 Being sun-safe is especially important for baby's sensitive skin. 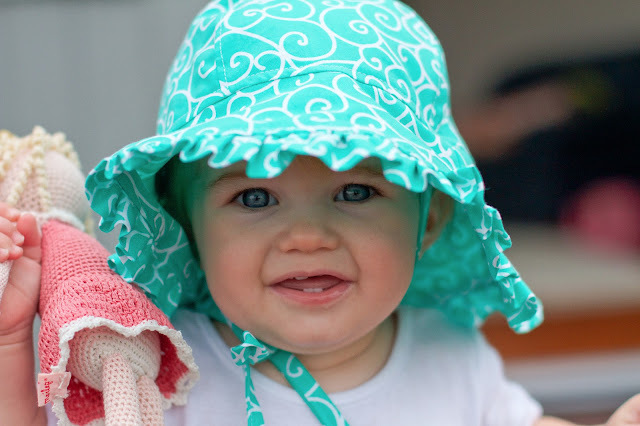 The Summer Carnival sun-hat is an essential baby wardrobe item - make sure you pop it on before heading out to the beach, pool or park this Summer to keep your baby cool and give you peace of mind. 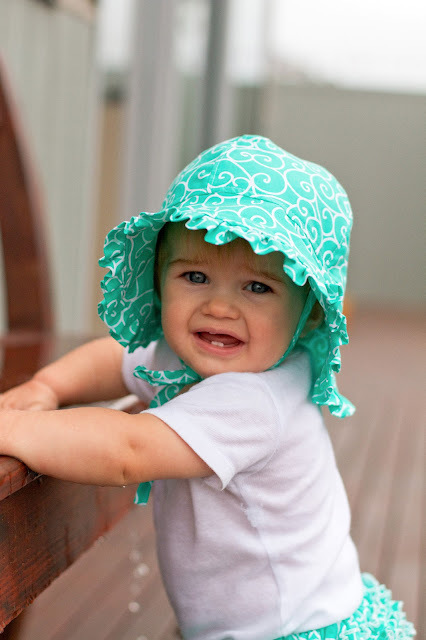 Featuring a wide, floppy brim and essential chin-ties, your baby will be the cutest thing around! Matching bloomers makes an adorable way to dress up any outfit, and with loads of room for the nappy they are super comfortable to wear. You can easily make this entire set boy-friendly by leaving off all the frills and ruffles. I'm in baby-sewing mode lately! Although I have a couple of other hat sewing patterns, I felt that I needed one that was geared explicitly toward babies. 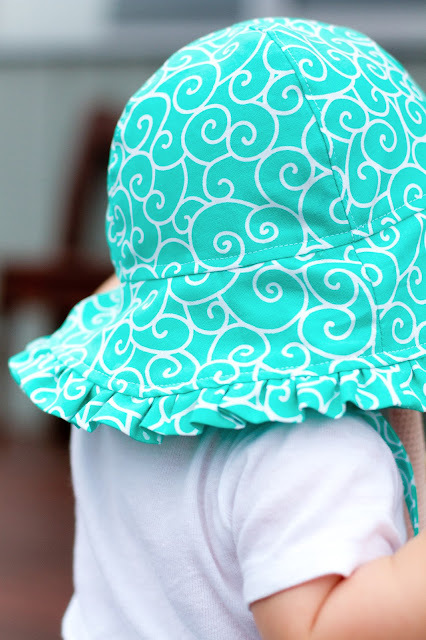 Baby hats need to provide great shade, fit snugly on the head and (most importantly) be impossible to pull off! And try as she might, my adorable niece Nancy couldn't get the thing off her head! 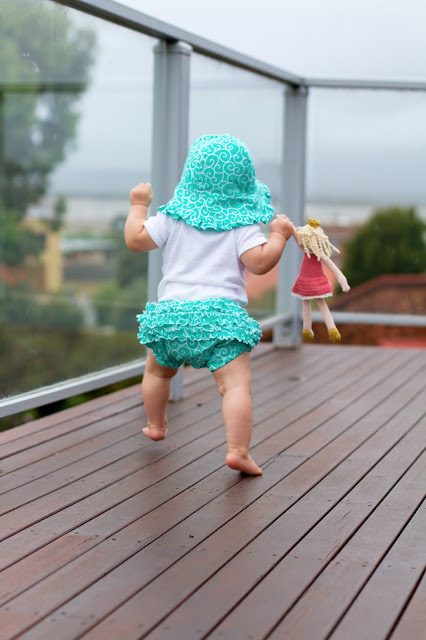 With the addition of some fun and easy to sew baby bloomers to cover the nappy, Summer Carnival makes a great baby shower or first birthday gift. And if you don't have little girls to sew for, never fear! This set looks just as gorgeous sewn up for a boy without any frills or ruffles, I'll share that variation with you later in the week to avoid photo overload here! 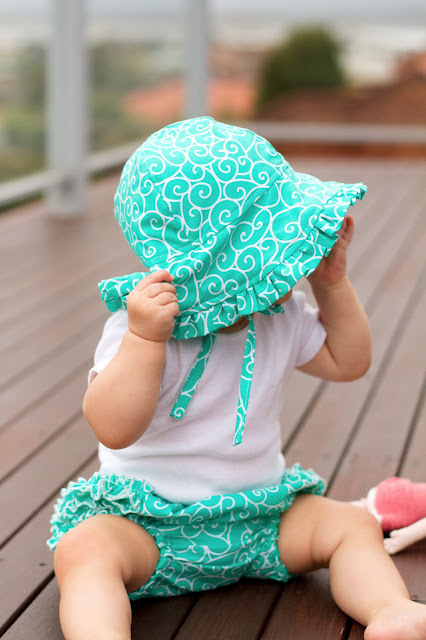 Summer Carnival fits sizes newborn to 24 months, all sizes are in the one pattern. You'll find more information about Summer Carnival on the Make It Perfect website. If you are looking for a place to purchase a copy of the pattern for yourself, take a look at our stockist or ask your favourite store to order one in for you. We can't have a new pattern without a giveaway...to win a copy of Summer Carnival, simply leave a comment on this blog post! (Please make sure you leave an email address with your comment. Giveaway will close Friday 1st March and winner will be drawn at random). And she's off! Can you believe Nancy is only 9 months old and is already toddling around?!!! Way to go little girl! Aw, that is exactly what I need for the baby this summer! Those are so cute! Would love to make them for my baby girl this summer! LOVE them!! Just what i need a new project to sew! Love that fabric - girlie without the pink! Can't wait to see the boy version. gorgeous, I love the hat! Looks Awesome Toni! And Nancy's first modelling debut was super cute! I love this fabric too. And I am so glad that it comes in a 'boy' version. Nice work! Gorgeous! Perfect new bub gift! Can't wait to see the boy version too. Super cute - the pattern & the sweet bubby! I'm having my first baby in nine weeks. Eep! We don't know what it is so I haven't sewn much for it. Because this is both boy and girl friendly it would make a perfect addition to my tiny stash of neutral patterns. What a great pattern! What an adorable model!!! Thanks for the fantastic giveaway! Love it! Have tons of little friends I could sew these for. Adorable!! I'll definitely be making some of these! Such a great set Toni, loook forward to seeing the other version too. This pattern would be the perfect item to make for my new twin, boy/girl, grandchildren. Thanks for the chance to win. Love ALL your patterns and this seems to a year of Babies in our family! Oh Toni this would be perfect and so fitting for my new little niece Summer!! Perfect and meant to be!! Her mama (my sister) is in a sewing frenzy right now so this has come at the perfect time! Awesome job! Oh my goodness, she's adorable. Love the little ensemble, so cute! Would love to learn how to make these!! Oh my goodness! This is just SO cute!! LOVE IT! Would like to sew this cut ensemble! Love it! Gosh, I'm due in 9 weeks time and have done absolutely no baby sewing at all! Nothing has excited me I guess...but these hat and bloomers are stunning! Thankyou for giving away such a great prize. So beautiful!! Cant wait to try the pattern. Thanks for the chance to win. Just love this adorable twosome of Summer Carnival hat and ruffled Bloomers! Oh Baby! Oh my. Just lovely! Perfect for all the bubbas! Just gorgeous! What a great style and the different fabric options would be endless! Love that set in demin, what a versatile pattern. I could certainly get lots of use from it for our baby girl, thanks for the chance to win one! Love these pants. They aren't as frilly as other I have seen. These are darling patterns! My youngest granddaughter is almost 1 and this would be perfect for her. THank you for the chance to win! I tried to make a pair, what a disaster they where. Your pattern looks so great, the frill's look FANTASTIC.